The Nigerian Chief of Army staff has admitted the fact that the Nigerian Army has shifted from its core constitutional responsibilities. Considering the fact that President Muhammadu Buhari has resorted to using excessive military mighty in responding to internal civil matters, the Nigerian Arm has raised alarm that it is being over stretched. General Tukur Buratai pointed out that the Nigerian army is currently engaged in war against the Boko Haram terrorists and other internal security operations in virtually all the 36 states of the federation. Lieutenant General Tukur Buratai While appraising the performance of the 2017 Appropriation Act, Buratai recalled that since the beginning of 2015, “the activities of the violent non-state actors had aggravated across the country.” He said in response to this the Nigerian Army had expanded from five to eight divisions. He said that such commitment had extended the army’s core constitutional roles and had impacted significantly on the army’s human and material resources. The Chief of Army Staff, Lieutenant General Buratai, has requested that the Nigerian government should increase it budget allocation for the Nigerian Army since it has been forced to expand its operations and now involved in internal war. He said that the inadequate budgetary allocation subsisting envelope budget system and partial release of funds had negatively affected the Nigerian army toward achieving an almost secured environment for the citizenry. He further said that in 2017 the sum of N133.44bn was proposed for personnel cost adding that this was released 100 percent. According to Buratai, in preparation for the 2018 Budget the Ministry of Budget and National Planning proposed the total sum of N233bn. “However, the Nigerian Army is requesting for the sum of N261.67bn. He noted that critical projects including procurement of drones and establishment of Aerial Reconnaissance (inspection) Intelligence Centre for the army would cost N2.05bn. Other projects, Buratai said, was rehabilitation of barracks at N5bn, procurement of more arms and ammunitions which was put at N4.8bn. “We have additional three divisions which are divisions 6, 7 and 8 that have been operationalised. 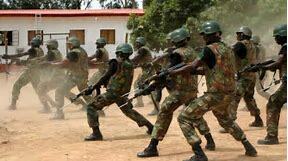 “Additional operationalised activation of these three divisions each will have approximately N1.5bn for the activation and further equipping of the divisions.” The chief of army staff further said that the army was committed to securing the territorial integrity of Nigeria from any violation. “The clearance operation to rid the country of the remnant of the Boko Haram terrorists and other criminal groups is currently ongoing,” Buratai said.